Download "A.3. Polynomials and Factoring. Polynomials. What you should learn. Definition of a Polynomial in x. Why you should learn it"
1 Appendi A.3 Polynomials and Factoring A23 A.3 Polynomials and Factoring What you should learn Write polynomials in standard form. Add,subtract,and multiply polynomials. 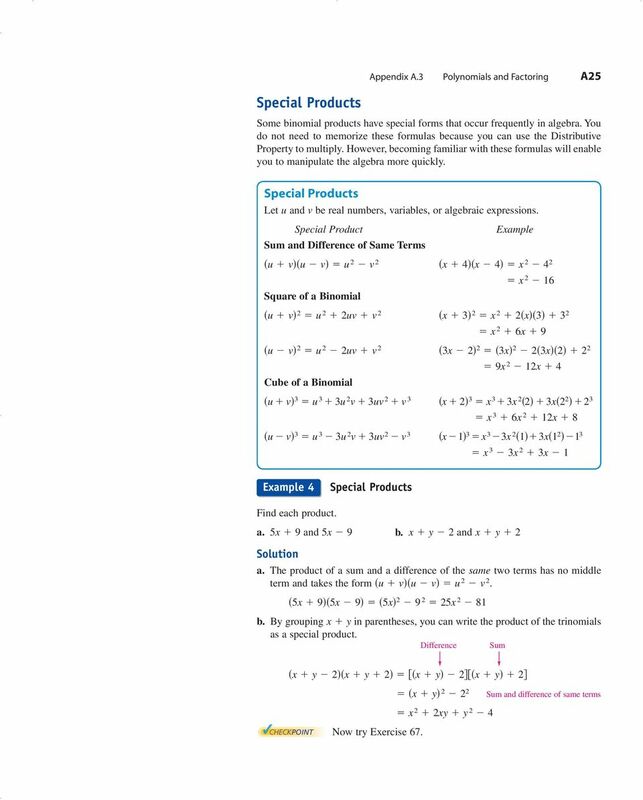 Use special products to multiply polynomials. Remove common factors from polynomials. 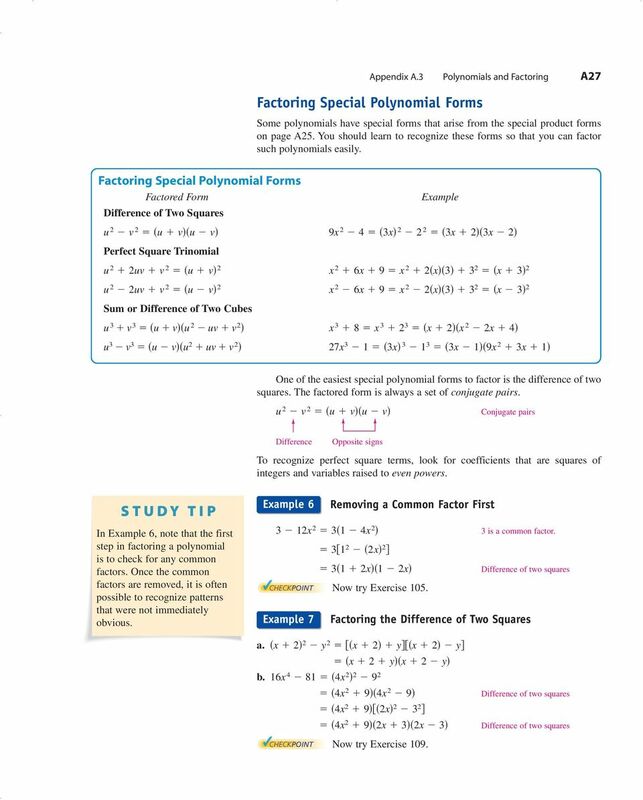 Factor special polynomial forms. 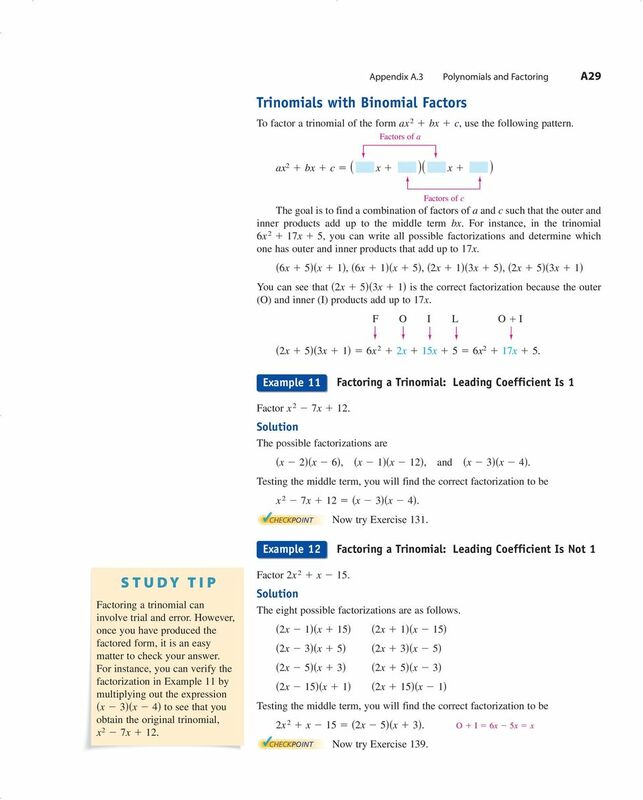 Factor trinomials as the product of two binomials. Factor polynomials by grouping. Why you should learn it Polynomials can be used to model and solve real-life problems. For instance, in Eercise 20 on page A34, a polynomial is used to model the stopping distance of an automobile. 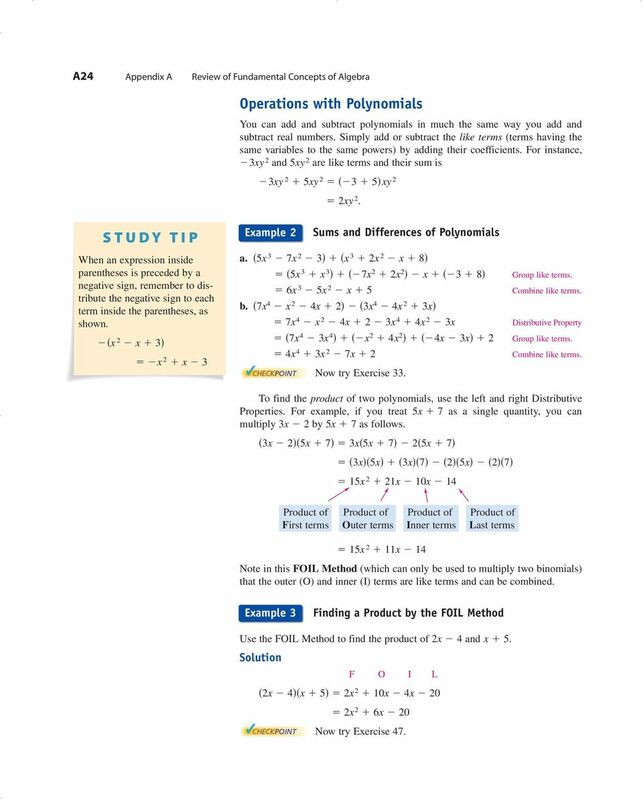 Polynomials The most common type of algebraic epression is the polynomial. Some eamples are 2 5, , and 5 2 y 2 y 3. The first two are polynomials in and the third is a polynomial in and y. The terms of a polynomial in have the form a k, where a is the coefficient and k is the degree of the term. For instance, the polynomial has coefficients 2, 5, 0, and. Definition of a Polynomial in Let a 0, a, a 2,..., a n be real numbers and let n be a nonnegative integer. A polynomial in is an epression of the form a n n a n n... a a 0 where a n 0. The polynomial is of degree n, a n is the leading coefficient, and is the constant term. a 0 Polynomials with one, two, and three terms are called monomials, binomials, and trinomials, respectively. In standard form, a polynomial is written with descending powers of. Eample Writing Polynomials in Standard Form Polynomial Standard Form Degree a b c Now try Eercise. A polynomial that has all zero coefficients is called the zero polynomial, denoted by 0. No degree is assigned to this particular polynomial. For polynomials in more than one variable, the degree of a term is the sum of the eponents of the variables in the term. The degree of the polynomial is the highest degree of its terms. For instance, the degree of the polynomial 2 3 y 6 4y 7 y 4 is because the sum of the eponents in the last term is the greatest. The leading coefficient of the polynomial is the coefficient of the highest-degree term. Epressions are not polynomials if a variable is underneath a radical or if a polynomial epression (with degree greater than 0) is in the denominator of a term. The following epressions are not polynomials The eponent 2 is not an integer The eponent is not a nonnegative integer. 2 A24 Appendi A Review of Fundamental Concepts of Algebra Operations with Polynomials You can add and subtract polynomials in much the same way you add and subtract real numbers. Simply add or subtract the like terms (terms having the same variables to the same powers) by adding their coefficients. For instance, 3y 2 and 5y 2 are like terms and their sum is 3y 2 5y y 2 2y 2. Eample 2 Sums and Differences of Polynomials When an epression inside parentheses is preceded by a negative sign, remember to distribute the negative sign to each term inside the parentheses, as shown a b Now try Eercise 33. Group like terms. Combine like terms. Distributive Property Group like terms. Combine like terms. To find the product of two polynomials, use the left and right Distributive Properties. For eample, if you treat 5 7 as a single quantity, you can multiply 3 2 by 5 7 as follows Product of First terms Product of Outer terms Product of Inner terms Product of Last terms Note in this FOIL Method (which can only be used to multiply two binomials) that the outer (O) and inner (I) terms are like terms and can be combined. Eample 3 Finding a Product by the FOIL Method Use the FOIL Method to find the product of 2 4 and 5. F O I L Now try Eercise 47. 3 Special Products Appendi A.3 Polynomials and Factoring A25 Some binomial products have special forms that occur frequently in algebra. You do not need to memorize these formulas because you can use the Distributive Property to multiply. However, becoming familiar with these formulas will enable you to manipulate the algebra more quickly. Special Products Let u and v be real numbers, variables, or algebraic epressions. 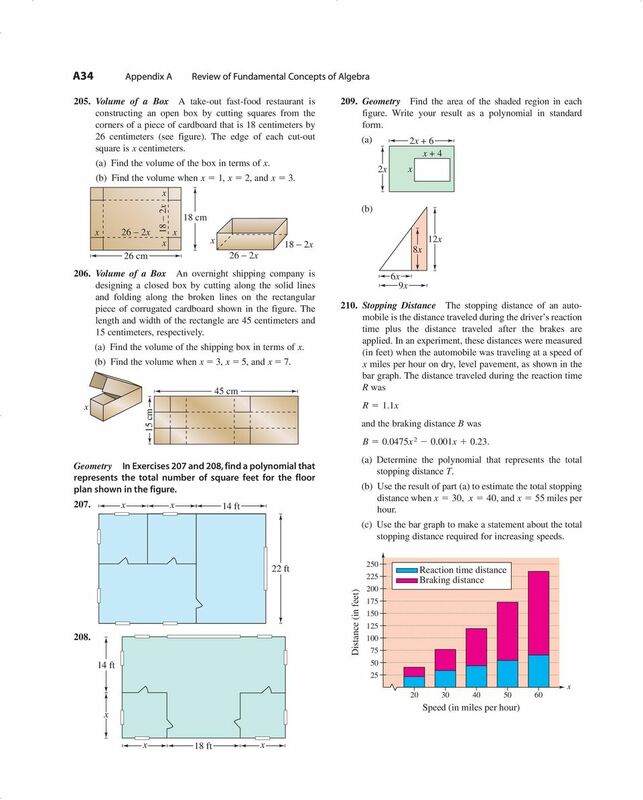 Special Product Eample Sum and Difference of Same Terms u v u v u 2 v 2 Square of a Binomial u v 2 u 2 2uv v u v 2 u 2 2uv v Cube of a Binomial u v 3 u 3 3u 2 v 3uv 2 v u v 3 u 3 3u 2 v 3uv 2 v Eample 4 Special Products Find each product. a. 5 9 and 5 9 b. y 2 and y 2 a. The product of a sum and a difference of the same two terms has no middle term and takes the form u v u v u 2 v b. By grouping y in parentheses, you can write the product of the trinomials as a special product. Difference Sum y 2 y 2 y 2 y 2 y Sum and difference of same terms 2 2y y 2 4 Now try Eercise 67. 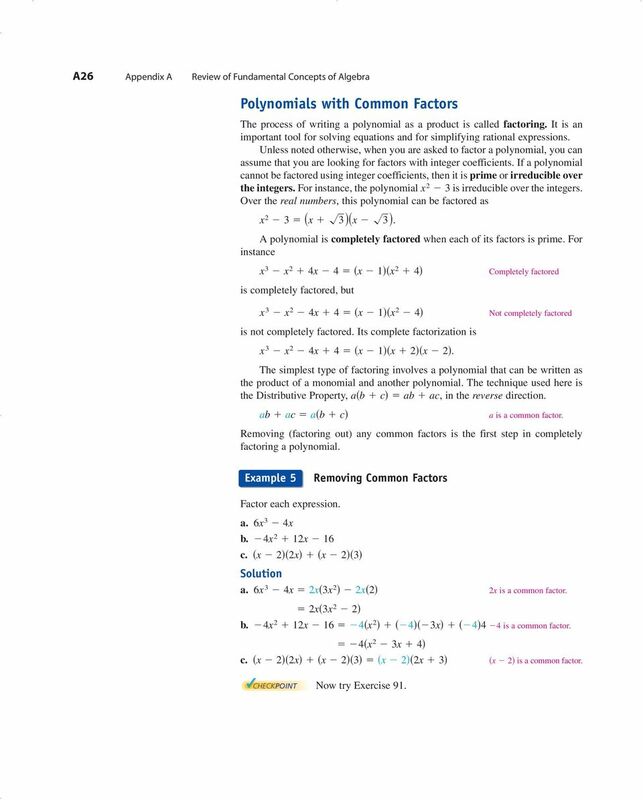 4 A26 Appendi A Review of Fundamental Concepts of Algebra Polynomials with Common Factors The process of writing a polynomial as a product is called factoring. It is an important tool for solving equations and for simplifying rational epressions. Unless noted otherwise, when you are asked to factor a polynomial, you can assume that you are looking for factors with integer coefficients. If a polynomial cannot be factored using integer coefficients, then it is prime or irreducible over the integers. For instance, the polynomial 2 3 is irreducible over the integers. Over the real numbers, this polynomial can be factored as A polynomial is completely factored when each of its factors is prime. For instance is completely factored, but is not completely factored. Its complete factorization is Completely factored Not completely factored The simplest type of factoring involves a polynomial that can be written as the product of a monomial and another polynomial. The technique used here is the Distributive Property, a b c ab ac, in the reverse direction. ab ac a b c a is a common factor. Removing (factoring out) any common factors is the first step in completely factoring a polynomial. Eample 5 Removing Common Factors Factor each epression. a b c a is a common factor b is a common factor c. 2 is a common factor. Now try Eercise 9. 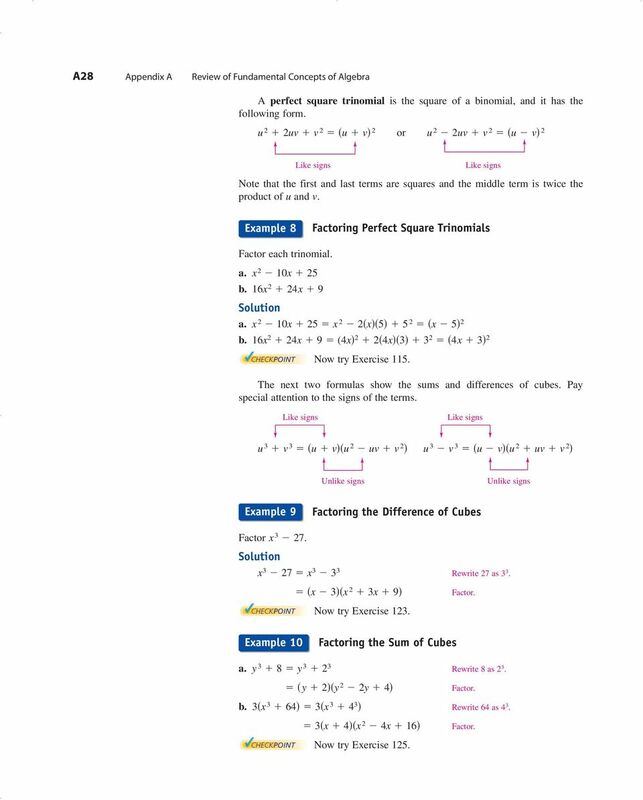 5 Appendi A.3 Polynomials and Factoring A27 Factoring Special Polynomial Forms Some polynomials have special forms that arise from the special product forms on page A25. You should learn to recognize these forms so that you can factor such polynomials easily. Factoring Special Polynomial Forms Factored Form Difference of Two Squares u 2 v 2 u v u v Eample Perfect Square Trinomial u 2 2uv v 2 u v 2 u 2 2uv v 2 u v Sum or Difference of Two Cubes u 3 v 3 u v u 2 uv v 2 u 3 v 3 u v u 2 uv v One of the easiest special polynomial forms to factor is the difference of two squares. The factored form is always a set of conjugate pairs. u 2 v 2 u v u v Conjugate pairs Difference Opposite signs To recognize perfect square terms, look for coefficients that are squares of integers and variables raised to even powers. Eample 6 Removing a Common Factor First In Eample 6, note that the first step in factoring a polynomial is to check for any common factors. Once the common factors are removed, it is often possible to recognize patterns that were not immediately obvious is a common factor. Difference of two squares Now try Eercise 05. Eample 7 Factoring the Difference of Two Squares a. 2 2 y 2 2 y 2 y 2 y 2 y b Difference of two squares Difference of two squares Now try Eercise 09. 6 A28 Appendi A Review of Fundamental Concepts of Algebra A perfect square trinomial is the square of a binomial, and it has the following form. u 2 2uv v 2 u v 2 or u 2 2uv v 2 u v 2 Like signs Like signs Note that the first and last terms are squares and the middle term is twice the product of u and v. Eample 8 Factoring Perfect Square Trinomials Factor each trinomial. a b a b ( Now try Eercise 5. The net two formulas show the sums and differences of cubes. Pay special attention to the signs of the terms. Like signs Like signs u 3 v 3 u v u 2 uv v 2 u 3 v 3 u v u 2 uv v 2 Unlike signs Unlike signs Eample 9 Factoring the Difference of Cubes Factor Now try Eercise 23. Rewrite 27 as 3 3. Factor. Eample 0 Factoring the Sum of Cubes a. y 3 8 y Rewrite 8 as 2 3. y 2 y 2 2y 4 Factor. b Rewrite 64 as Factor. Now try Eercise 25. 7 Trinomials with Binomial Factors Appendi A.3 Polynomials and Factoring A29 To factor a trinomial of the form a 2 b c, use the following pattern. Factors of a a 2 b c Factors of c The goal is to find a combination of factors of a and c such that the outer and inner products add up to the middle term b. For instance, in the trinomial , you can write all possible factorizations and determine which one has outer and inner products that add up to , 6 5, 2 3 5, You can see that is the correct factorization because the outer (O) and inner (I) products add up to 7. F O I L O I Eample Factoring a Trinomial: Leading Coefficient Is Factor The possible factorizations are 2 6, 2, and 3 4. Testing the middle term, you will find the correct factorization to be Now try Eercise 3. Eample 2 Factoring a Trinomial: Leading Coefficient Is Not Factoring a trinomial can involve trial and error. However, once you have produced the factored form, it is an easy matter to check your answer. For instance, you can verify the factorization in Eample by multiplying out the epression 3 4 to see that you obtain the original trinomial, Factor The eight possible factorizations are as follows Testing the middle term, you will find the correct factorization to be O I 6 5 Now try Eercise 39. 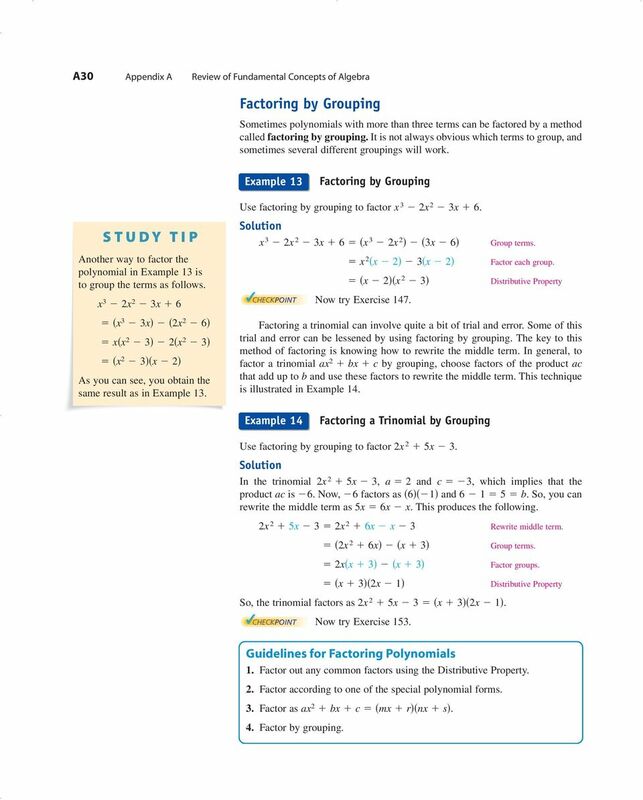 8 A30 Appendi A Review of Fundamental Concepts of Algebra Factoring by Grouping Sometimes polynomials with more than three terms can be factored by a method called factoring by grouping. It is not always obvious which terms to group, and sometimes several different groupings will work. Eample 3 Factoring by Grouping Another way to factor the polynomial in Eample 3 is to group the terms as follows As you can see, you obtain the same result as in Eample 3. Use factoring by grouping to factor Now try Eercise 47. Group terms. Factor each group. Distributive Property Factoring a trinomial can involve quite a bit of trial and error. Some of this trial and error can be lessened by using factoring by grouping. The key to this method of factoring is knowing how to rewrite the middle term. In general, to factor a trinomial a 2 b c by grouping, choose factors of the product ac that add up to b and use these factors to rewrite the middle term. This technique is illustrated in Eample 4. Eample 4 Factoring a Trinomial by Grouping Use factoring by grouping to factor In the trinomial , a 2 and c 3, which implies that the product ac is 6. Now, 6 factors as 6 and 6 5 b. So, you can rewrite the middle term as 5 6. This produces the following Rewrite middle term Group terms Factor groups. 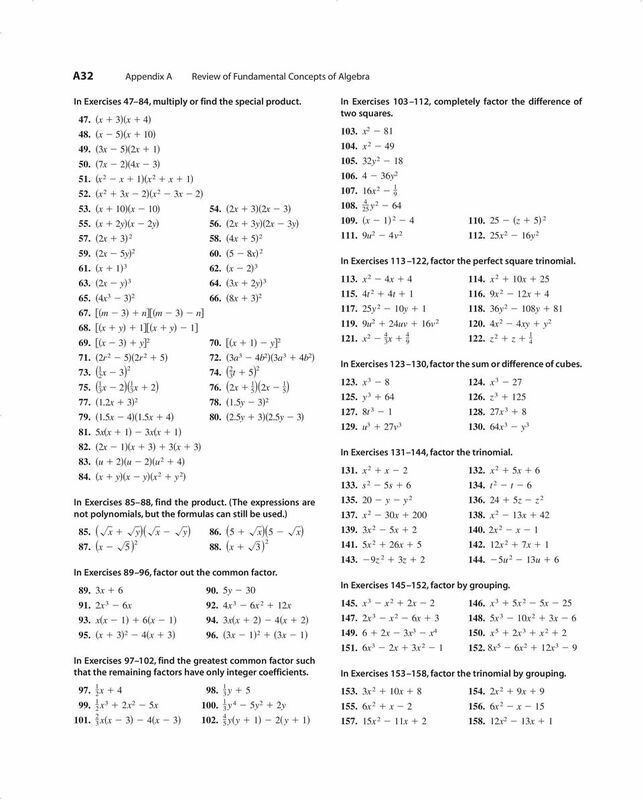 3 2 Distributive Property So, the trinomial factors as Now try Eercise 53. 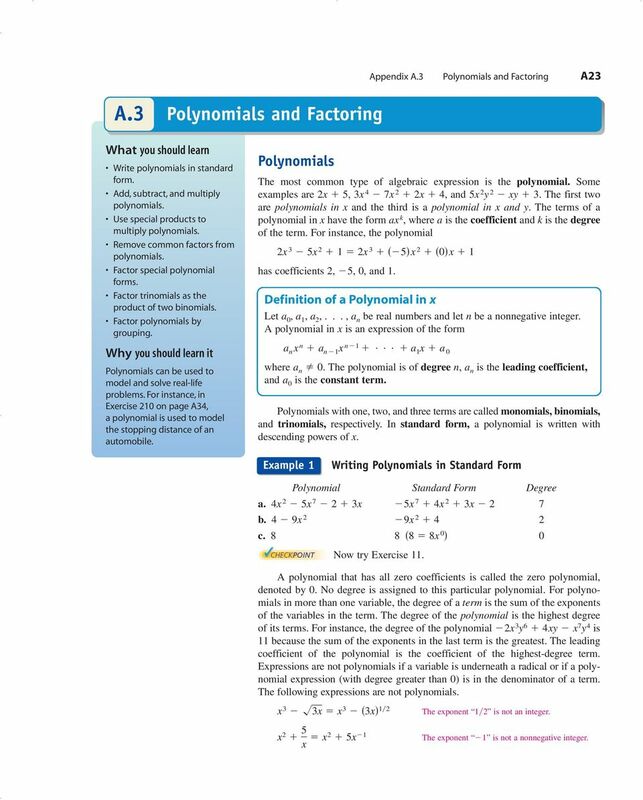 Guidelines for Factoring Polynomials. Factor out any common factors using the Distributive Property. 2. Factor according to one of the special polynomial forms. 3. Factor as a 2 b c m r n s. 4. Factor by grouping. 11 Appendi A.3 Polynomials and Factoring A33 In Eercises 59 92, completely factor the epression y 3 7y 2 5y u 2u 2 6 u t t In Eercises 93 96, find all values of b for which the trinomial can be factored b b b b 24 In Eercises , find two integer values of c such that the trinomial can be factored. (There are many correct answers.) c c c c 20. Cost, Revenue, and Profit An electronics manufacturer can produce and sell radios per week. The total cost C (in dollars) of producing radios is C 73 25,000 and the total revenue R (in dollars) is R 95. (a) Find the profit P in terms of. (b) Find the profit obtained by selling 5000 radios per week Cost, Revenue, and Profit An artisan can produce and sell hats per month. The total cost C (in dollars) of producing hats is C and the total revenue R (in dollars) is R 36. (a) Find the profit P in terms of. (b) Find the profit obtained by selling 42 hats per month Compound Interest After 2 years, an investment of $500 compounded annually at an interest rate r will yield an amount of 500 r 2. (a) Write this polynomial in standard form. (b) Use a calculator to evaluate the polynomial for the values of r shown in the table. r 2 2% 3% 4% 42% 5% 500 r 2 (c) What conclusion can you make from the table? 204. Compound Interest After 3 years, an investment of $200 compounded annually at an interest rate r will yield an amount of 200 r 3. (a) Write this polynomial in standard form. (b) Use a calculator to evaluate the polynomial for the values of r shown in the table. r 2% 3% 3 2% 4% 42% 200 r 3 (c) What conclusion can you make from the table? Five C H A P T E R Rational Epressions and Equations. Rational Epressions and Functions. Multiplication and Division of Rational Epressions. Addition and Subtraction of Rational Epressions.4 Comple Fractions. Polynomial and Synthetic Division. Long Division of Polynomials. Example 1. 6x 2 7x 2 x 2) 19x 2 16x 4 6x3 12x 2 7x 2 16x 7x 2 14x. 2x 4. We start with the basic operations on polynomials, that is adding, subtracting, and multiplying. a. You can t do the simple trick of finding two integers that multiply to give 6 and add to give 5 because the a (a = 4) is not equal to one. 8-8 Differences of Squares. Factor each polynomial. 1. x 9 SOLUTION: 2. 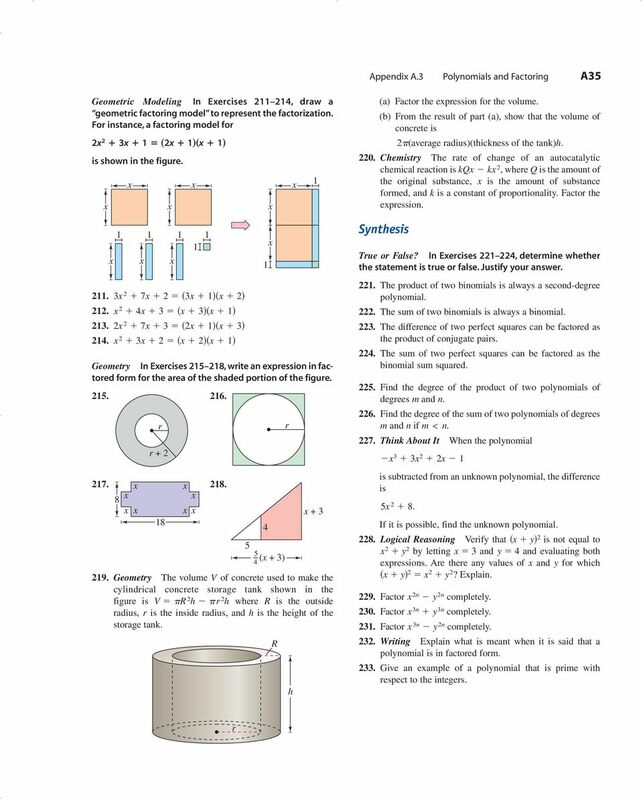 4a 25 SOLUTION: 3. 9m 144 SOLUTION: 4. 2p 162p SOLUTION: 5. ACTIVITY: Multiplying Binomials Using Algebra Tiles. Work with a partner. Six different algebra tiles are shown below. As evident above, you will need strong factoring skills to find the domain of many rational expressions. GRE MATH REVIEW #5. 1. Variable: A letter that represents an unknown number. called and explain why it cannot be factored with algebra tiles? and explain why it cannot be factored with algebra tiles?